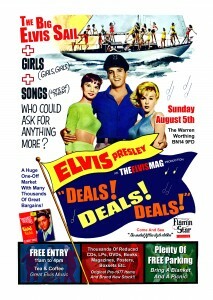 In Just over one week’s time we will be staging our big Elvis market in Worthing. More incredible stock than ever before, and lots of super bargains. Along with Beth Dunne and the Flamin Star Clothing company, the Essential Elvis UK team look forward to seeing you for some great shopping and a get-together. Our little seaside town is beautiful right now, so why not make a day of it? This entry was posted on Thursday, July 26th, 2018 at 5:15 pm	and is filed under Essential Elvis News, General Elvis News. You can follow any responses to this entry through the RSS 2.0 feed.